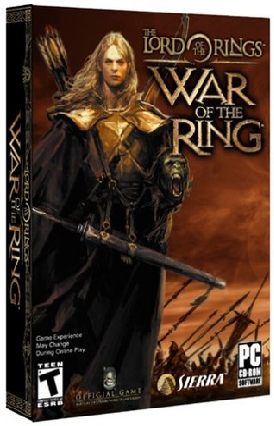 The Lord of the Rings: War of the Ring is a 2003 real-time strategy game (RTS) developed by Liquid Entertainment, the makers of the previous Battle Realms and its expansion, Winter of the Wolf, and published by Sierra Entertainment. Set in J. R. R. Tolkien’s fictional Middle-earth, it expands upon the events of the War of the Ring as told in his fantasy novel, The Lord of the Rings. The game received below average to average reviews in general. Common points raised were its relatively unsophisticated (i.e. "basic" or "vanilla" or even "generic") nature compared to others in the genre, and its similarity to Warcraft III. In an official GameSpot review, Jason Ocampo called it "a competent, if lackluster, effort" which would probably appeal best to "casual gamers" instead of veteran real-time strategy players, as well as "Middle-earth fans", an opinion shared by Dan Adams of IGN. Speaking as a Tolkien "geek", Adams noted that fans of the book may find it "weird" (as he did) to see several RTS conventions applied to Tolkien's world, such as "elves and humans and dwarves... popping out of buildings" and "harvesting ore in the middle of a green field". He also noted that the game's scheme of diverse peoples and creatures fighting side-by-side led to "bizarre" situations untrue to the book. Playing as the Evil faction, Adams said the "population cap" (100) and the amount of "population slots" most units each take up (at least 3) made it "hard to get the feeling of superior numbers." Nevertheless, Adams said his familiarity of Tolkien's works had influenced his opinions, and that Vivendi had aimed for a game that was easy to identify with and understand. He said players who were less familiar with Tolkien's works (or were less fastidious about accuracy) would probably not have such issues.